All Dancers from College Sports Clubs, Dancing Schools or other Dancing groups are permitted to take part in this tournament, if the following terms are met. As ours is a Breitensport (amateur) tournament, we exclude dancers who own a tournament license of German C Class (or equivalent) or higher as well as formation dancers competing in 1st or 2nd National League. Dancers who own a tournament license for Standard only and who have never danced a higher class than German C class (or equivalent) are eligible to compete in Latin dances. 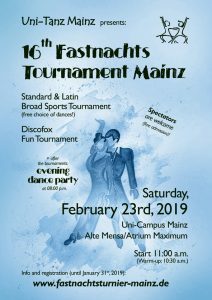 Participants who own a tournament license only for Latin and have never danced a higher class than German C class or equivalent can compete in the Standard section. Every couple is authorized to attend as many (or few) dances as they like, in accordance with the rules given above. Professional made clothing, rhinestones, overly shiny decorations as well as very revealing clothing are not permitted. In any particular instance the decision will be taken by the Tournament directors. Every one of the 10 dances will be judged separately. Thus it is possible e.g. to advance to the next round of Tango while being eliminated from the Slow Waltz tournament. There will be a special rating for Ballroom and for Latin dancing. For this purpose the three best results of each couple in Latin or Standard, respectively, are added together. Couples who do less than three dances in each category will not take part in the special rating. The Discofox is rated as a separate tournament. The overall ranking of a given couple is calculated from six results (the best three results of their performance in Ballroom and the best three results of their Latin performance). Only couples who participate in at least three dances of each category will be included in the overall ranking. The ten dance result is the sum of every result achieved in Ballroom and Latin dancing. Only couples who participate in all five dances of each category will be included in the overall ranking. For newcomers in tournament sport there is a special classification. A couple is defined as Newcomer if both participants have never competed in any tournament before. To win the Newcomer Trophy, four dances will be judged. Those involve the two best performances in Ballroom and the two best performances in Latin. The Discofox tournament is open to all dancers who have never competed in regular Discofox competitions! Lifts, sliding/skidding variations and other movements in which the weight of one (or both) of the partners is off both of their feet are not allowed: At least one foot must hold at least a good part of the weight, and we strongly discourage executing movements with excessive vehemence or impetus.